Laying realistic, reliable and trouble free track is not impossible, and this Article provides practical steps and tips to get you going in the right direction. In order to cut your rail in a manner that leaves a square and usable end, use a flush cutting pliers, or better, get a specialized rail cutter. A clean and flush cut that, after a quick pass with a small file, will allow you to slip the rail joiners on easily is desirable. Specialized rail cutters typically produce a flush cut on one side and an unusable tapered cut on the other. 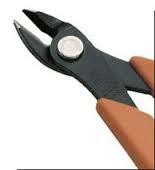 Traditional wire cutters leave two tapered and unusable ends. 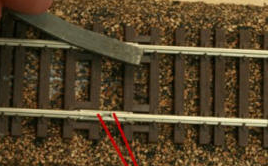 One of the best ways to attach track to the roadbed is by using Adhesives. 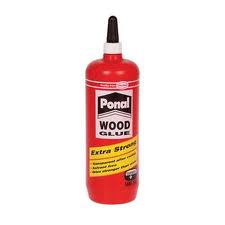 One of the advantages of using standard white-glue type adhesive is that track can reasonably easily be removed if required, whereas glues such as “Super glue” will typically involve breaking something.. Trains are relatively light and it generally takes very little adhesive to hold the track down. 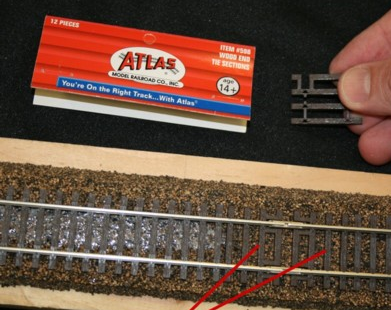 In cases where the track will be ballasted in the near future, it takes very little glue to hold things in place until the ballast is added. Track that will NEVER be ballasted (staging yards etc. 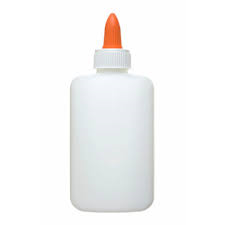 ): Use a thin line of white glue or even some adhesive caulk. In staging yards you may add a few track nails for extra insurance. Track that will definitely be removed or adjusted: a small drop of white glue every six inches or so. The amount and type of adhesive is governed by whether the track is temporary and whether it will ultimately be ballasted or not. For track that will not be relocated and will eventually be ballasted a thin strip of white glue is adequate. Moving or adjusting track that has been secured with white glue is relatively easy. In locations where the rail will never be ballasted (such as staging yards), you can use more adhesive than other areas of the layout that will eventually be covered with scenery. Keep in mind that without the anchoring affect of the ballast, something else needs to provide the “hold”. Solutions include using adhesive caulk, slightly larger quantities of white glue, or drilling the ties and securing the track to the roadbed with track nails. 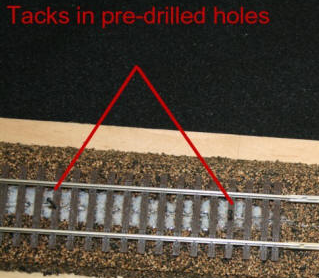 For staging yards pre-drill your flex track so that track nails can be driven through the ties. 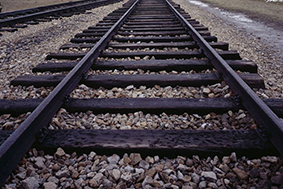 One of the most common causes of track failure is rail buckling. Keep in mind that your layout may contract and expand depending on weather conditions and seasonal climate changes. As winter approaches and the humidity drops, your bench work and sub-roadbed will tend to shrink. If there are not adequate gaps at your rail joints the track has no where to go and will buckle up or out. Curved turnouts are particularly prone to buckling. Rail that becomes heated from sources like an overhead heating duct or hot sun shining through a window, will expand and also buckle. One possible solution is to provide adequate gaps at the rail joints. When in doubt, err on the side of a larger gap. While some modellers recommend soldering rail joints, this may actually prevent them from expanding and contracting freely. 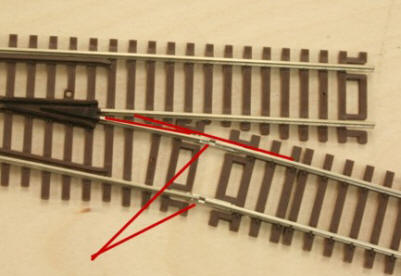 As you begin to lay track around the layout there are a few trouble spots to be aware of. 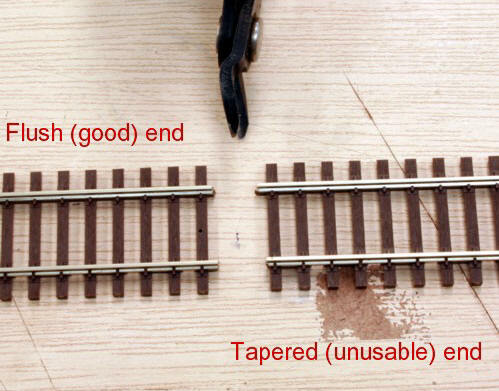 Some of the more common errors and sources of derailments are missing a rail joiner connection and sharp bumps at the rail joints caused by slipping overly thick ties under the rail joiners. 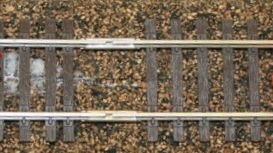 As you join your rails, you will quickly find that the ties at the end of your flex track are in the way. You can either remove enough ties to make room for the joiners or cut away the frets between the ties and slide them down or a combination of the above. After you’ve joined two flex track sections you will now be faced with section of track with no ties. Some manufacturers such as Atlas and Peco make specialty end tie pieces that work perfectly for solving the problem. If you don’t have that luxury, you will need to slip replacement ties in the gap. Be careful. With the rail joiner now in place, you no longer have a large enough space under the rail to slip standard ties back in. Forcing the issue will create a bump at the joint and a common source of derailments. To get around this, take some standard ties and, using a blade or Dremel router, make a small cup in the tie to clear the joiners. This is tedious but does solve the problem. In order to make room for your rail joiners you’ll need to remove a few ties and/or slide them down a little. This is easy enough to do by clipping away the plastic frets between the ties and then either removing the ties or sliding them down. It’s easy to get in a hurry and inadvertently miss catching both rail ends with the joiner. When this happens a step is created that will, without doubt, cause derailments. This is sort of a pain to fix if you catch it after the rail is down so its worth paying attention and avoiding this error. Forcing standard depth ties under the rail joiners will create a pronounced bump at the joint. 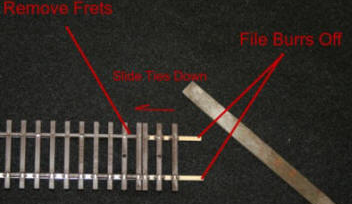 There are two general ways to install ties under the rail joiners without producing the bump. a Second method is to carve a cup in the tie deep enough to clear the rail joiners. 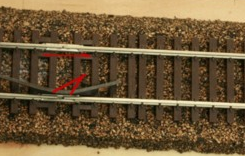 While many modellers focus entirely on horizontal alignment when laying track, a high percentage of track problems can be traced to grade transitions. A typical problem relates to kinks in the vertical plane, which is basically an abrupt transitions/kinks when entering a grade or perhaps stepping down from a main line to a slightly lower siding. The trick is to let the weight of the track and its natural sag naturally define the vertical curve. Don’t force the track down at these transition points. Here you can see the sharp kink that can occur at the point where the track transitions from being level to an uphill slope. While “cleaning up” can have many meanings, here we are referring to the fine-tuning of your track by cleaning or removing excess burrs, solder and other debris from the track. It’s common to have small burrs at the rail ends. These can be caused from minor misalignment, miniscule height differences or rough edges from cutting the rail. These rough spots are easy enough to clean up by make a few light passes with a fine file over the top of the rail heads at the gap. The most frequent location of derailments are likely to be at your turnouts. That being the case, your life will be made much easier if you pay particular attention to them. Points that aren’t thrown completely across. A common problem area is where a turnout is located right at the exit of a curve. If the curve hasn’t finished its arc, or there isn’t enough of a transition, a kink will occur causing future derailments. Make sure you have smooth transitions out of the turnout at the frog end as well. Errant particles of ballast wreak havoc on turnout reliability and are a common source of derailments. It only takes one small grain to create problems. Use an Optivisor / magnifying glass and make sure the entire turnout is clean and free of ballast. 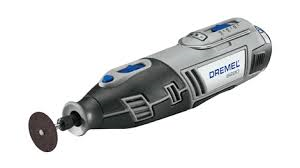 Stiff brushes and small screw drivers make effective cleaning tools. 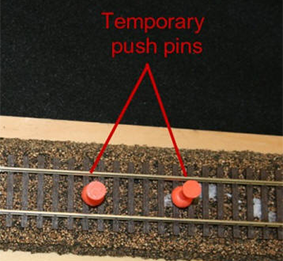 Make sure that there are no ballast particles preventing the points from moving tightly against the stock rail. Modern Manufacturing and production facilities have greatly reduced the problem of out-of-gauge track, and it is highly unlikely that modern commercial track will have this problem. 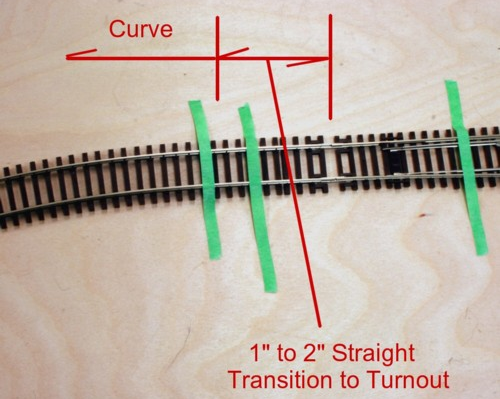 So while a lot has been written about making sure your track is properly gauged (which means the rails aren’t too close or too far apart), practical experience and reality pretty much shows that it is fairly unlikely that a straight piece of commercially produced piece of straight flex track will be out of gauge. That said, there is no harm in checking, and it will only take a few moments of your time to double check. So, yes it’s important, but don’t waste a lot of time with a track gauge until you’ve run through the other troubleshooting checks. It is important that you lay your tracks in such a manner that two trains will not touch or collide when they pass each other. We call this track separation, and is critical to ensure that parallel tracks be far enough apart that cars don’t sideswipe one another. Laying long straight sections of track can be challenging, but with a simple technique it is very easy and your track will look great. Straight track is more of an aesthetic issue than one of mechanical reliability. Minor wiggles in the track, while unsightly, generally do not cause derailments. To get the track as straight as possible place a long aluminum rule against the edge of the ties and gently push the edge of the ties against the rule. Place your eyes a few inches above the track and sight down the center line adjusting the rail until you’ve gotten it as straight as possible. As you begin laying your track around larger curves you will quickly find that your 900mm – 1m (3 foot) flex track pieces aren’t long enough to make it around a full curve. 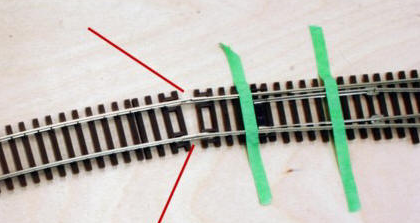 You will also quickly learn that bending individual pieces of track around a curve and joining them doesn’t work because you get a sharp kink at the joint due too much outward stress in the track at the curved joint to make a smooth connection. Fortunately, the solution is fairly simple. In short, what you need to do is join two STRAIGHT pieces of flex track together on your work bench and solder the joint BEFORE placing it on the layout and making the curve. You will find that as you make the curve that some of the ties will ride up tightly against the joiners making it difficult to bend the track. Simply snip away enough of the offending ties until you can make a smooth curve.